ITAD provider certified for hard drive and nonpaper media destruction at its San Diego plant. Clients using Avritek’s data destruction services satisfy their regulatory due diligence requirements in addition to validating and monitoring security. 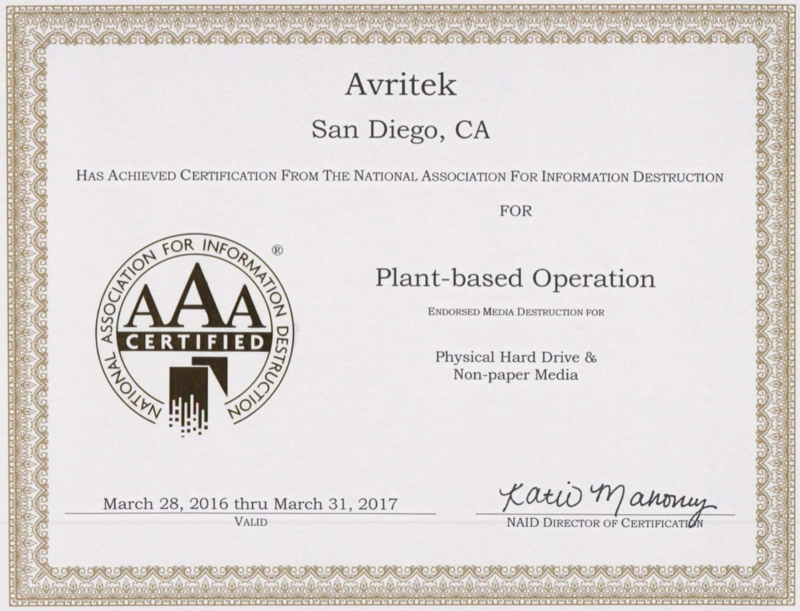 Avritek, San Diego, has announced that it has earned NAID AAA Certification from the National Association for Information Destruction (NAID), Phoenix. NAID is the standards setting body for the information destruction industry. NAID AAA Certification verifies the qualifications of certified information destruction providers through a comprehensive scheduled and unannounced audit program, as well as by requiring strict security measures, such as access control, remote video monitoring and personnel background checks. “We are thrilled to announce that we have received our NAID AAA Certification for data destruction,” says CEO Ed Pletner. Avritek provides business critical hardware life-cycle services, such as data destruction, reverse logistics, technology recycling and asset recovery. Headquartered in San Diego, CA, Avritek services accounts throughout Southern California and nationwide.